There was an old lady who gobbled a skink. 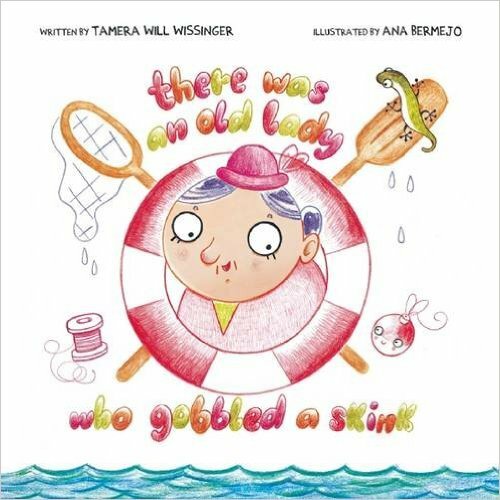 And a worm and a pail and a line and an oar and much more in this hilarious book about a crazy fisherwoman who swallows all the essentials for a successful fishing trip. With the ever looming threat of “perhaps she’ll sink,” readers will hold their breath in anticipation as she gobbles her way through the tackle box and then the boat! With an already impressively full stomach, she reaches for just one last bite . . . but to find out how the story ends, you have to read the book! Intended for preschool-aged children, this silly story is sure to be a fun read-aloud both at home or at school/daycare. It's also the ideal gift for kids whose parents or grandparents love to fish or to explore the outdoors and might even inspire a few to try fishing at some point (hopefully without gobbling any of the tackle!). EXCELLENT EXCELLENT BOOK! Davey likes the book so much he wanted me to read the book to his friend when he was visiting.